The aim was to use nothing but materials I had around the house to build my solar oven. I was successful except that I had to buy a $5 oven thermometer at Walmart because I couldn’t find the oven thermometer I already had. Oops! 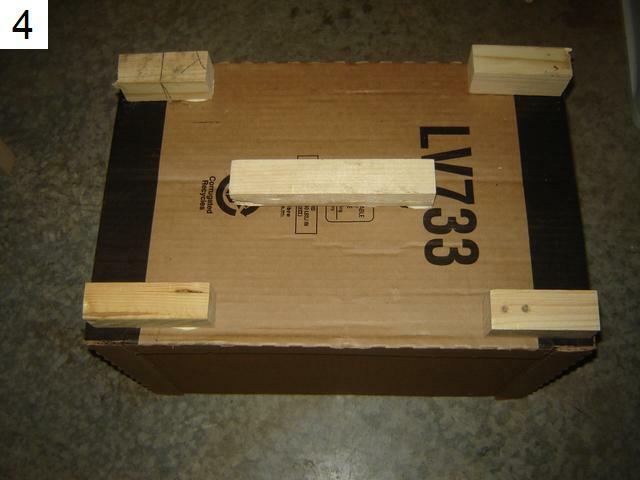 Dimensions: The outer box is 23.5” long x 19” wide x 10” tall, while the inner box is 19” long x 12″ wide x 9″ tall. The completed unit weighs less than 8 pounds. Compared to the Global Sun Oven at 14″ long x 14″ wide x 7.5″ usable depth my design is slight longer but not quite as wide. I really didn’t plan it that way, I just found two boxes that I figured would work. 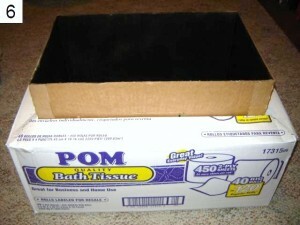 I think it will be beneficial to be longer because I could easily place a rectangular baking dish inside if I wanted. With respect to weight, the Global Sun Oven weighs about 3 times as much. Materials: 2 cardboard boxes (of appropriate sizes), lots of shredded paper, a few scraps of wood, wood glue, aluminum foil (originally used black spray paint), packing tape, cling wrap (should have used clear plastic wrap), and a reflective windshield sunshade or something similar. 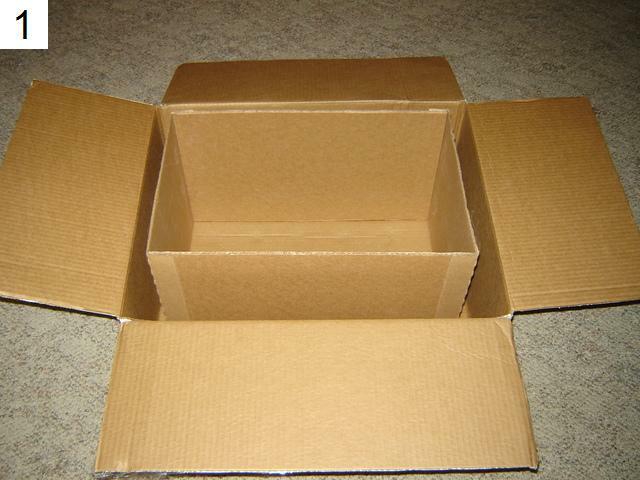 Find two boxes, one that will fit within the other and that allows for two or three inches of air space between them around all sides. Begin filling the bottom of the outer box with shredded paper to act as insulation (Note: I actually dumped out the insulation later so that I could glue the inner box to the outer box but that’s probably not necessary if I had packed the shredded paper really well). 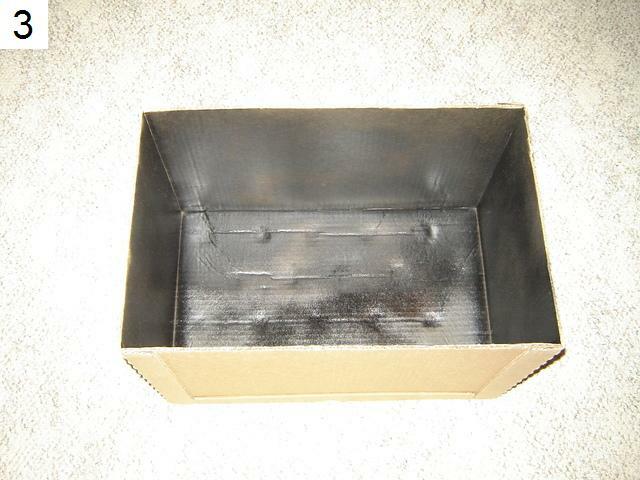 Paint the inside of the inner box with black spray paint to better absorb the sun’s energy. I really should have used non off-gassing paint here but I figured I could heat it up without any food several times before actually using the oven to cook food. In addition, I would also assume you could paint the outside of the outer box to increase efficiency too. Place the inner box inside the outer box, center, and glue the inner box down where the scrap wood pieces meet the bottom of the outer box. 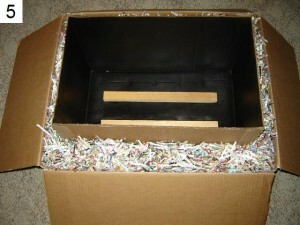 (Remember that I dumped the shredded paper out as noted in step 2 in order to glue the box down.) Now pack the entire air space between the boxes with shredded paper to the top. I stuffed it fairly well. Cut and fold the flaps of the outer box so that they meet up with the inner box. It doesn’t have to be fancy, just get close. Now tape the flaps down with packing tape. Next, I cut off the top of the inner box leaving about 1/2″ of the inner box exposed above the outer box so that I had a lip to work with. 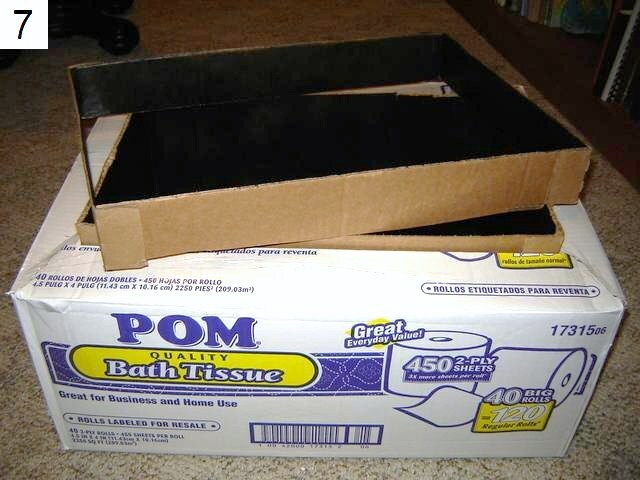 Depending on what you intend to do it may be beneficial for the inner box to be flush with the outer box; I figured I could always cut it off later. I first tested what would happen with just cling wrap and no reflectors. It never dawned on me that the cling wrap wasn’t wide enough to fit in one piece over the inner box so I ended up using two pieces. Unfortunately, the wind blew the cling wrap off and the oven thermometer inside didn’t even register a temperature. I didn’t try that again. Instead, I tried adding a reflector, an old windshield sunshade, which easily wrapped around three sides of my oven and actually slid down between the two boxes several inches after cutting the sunshade down a bit to fit. After replacing the cling wrap, I got the temps up to about 200 degrees Fahrenheit. If I had bothered to angle the solar oven toward the sun (as I would have with the Global Sun Oven) I might be able to get the temps above boiling. 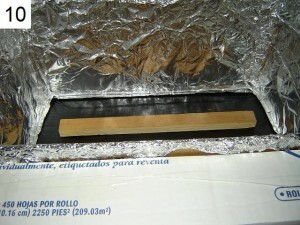 Out of curiosity, I tried lining the sides with aluminum foil. This worked out the best as I was able to get the temperature to about 225 degrees. If I could start over I would not have painted the inside of the inner box with black spray paint and just used foil instead. As I wanted something more durable than the cling wrap, I decided to sacrifice a piece of semi-clear plastic from a drawer that I didn’t need. After carefully cutting it to fit the top of the inner box, I tested and found that this idea seemed to work even worse than the cling wrap! 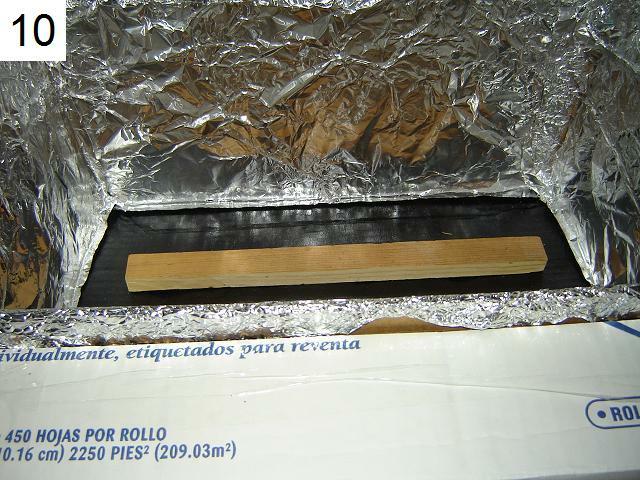 I thought that maybe I was losing too much heat where the plastic met the top of the inner box so I tried adding some weather-stripping to smooth out any imperfections which seemed to help a bit but didn’t exceed temperatures that I could get with cling wrap alone. All in all, the experiment could have been completed within an hour if I had shredded paper available. 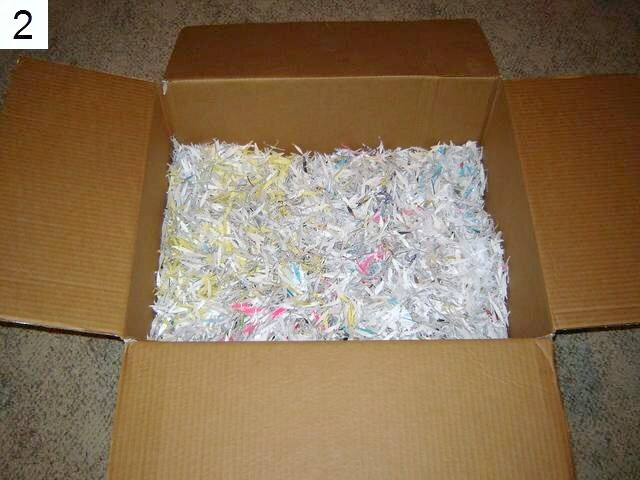 I actually spent over a week to do the experiment simply because I didn’t have enough shredded paper. I eventually just shredded some junk mail. I would imagine you could use other insulation, such as crumpled up newspaper to less effect. Use aluminum foil to line the insides of the inner box and paint the outside of the outer box with black spray paint. 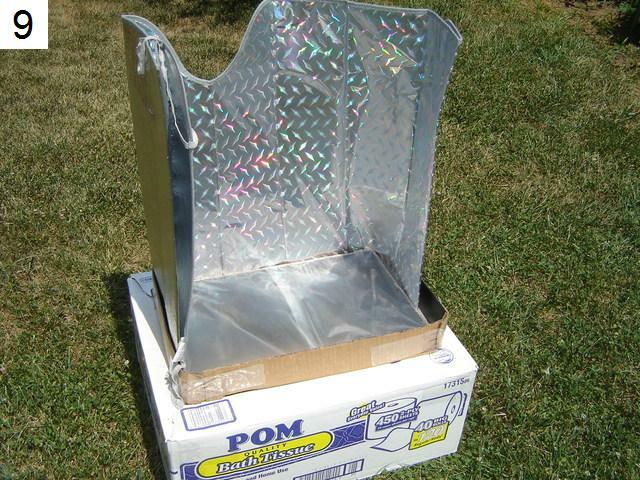 I would also suggest you use non off-gassing spray paint if you’re going to use your solar oven to cook food. 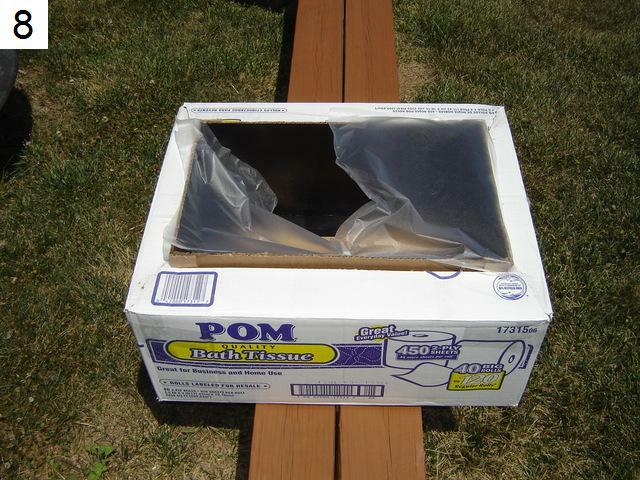 I would recommend using clear plastic wrap instead of cling wrap because cling wrap is not completely clear and probably limits the amount of sunlight that enters the inner box, just as the semi-clear plastic I tried. Cling wrap is what I had lying around so that’s what I used. To make the oven more durable I would think that a sheet of plexiglass or window glass would work. In this case I should have probably cut the inner box flush with the outer box. Using a sunshade reflector definitely helped. I considered angling the sunshade outward to get the correct angles like you’re supposed to but I didn’t want to compromise the integrity of an already flimsy sunshade. I’m not sure what kind of increases in temperature I would have gotten from doing so but I would suspect it is a good idea if able. Perhaps I’ll try next time. 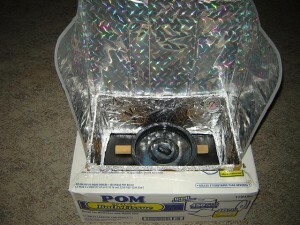 Last, because my solar oven is made of cardboard and cling wrap it won’t take much abuse. Of course, I believe that I could make it last for quite some time if I had to. All in all, I would say it is definitely possible to make your own solar oven for next to nothing. It may not be as ideal as a Global Sun Oven, but with a few additional tweaks it could certainly be your best bang for the buck. The only question is: would you rely on it?